1. Few wild places in the U.S. contain such a variety of spectacular landscapes and bio-diversity as the Olympic Peninsula on the Washington State coast, approximately an hour west of Seattle. Dominating most of the Peninsula is the Olympic National Forest and Park and its more than 633,000 acres of grand Pacific coastlines, towering Olympic Mountains and valleys of dense rain forests, pristine lakes and rivers and some of the world’s tallest trees. 2. Wherever you turn or travel, the Olympic Peninsula offers the advanced photographer a learning laboratory of vistas, panoramas and the smallest details of nature in great abundance. 3. Some of these small details are the incredible displays of wildflowers on the Peninsula from the first warm days of spring into late summer. Early in the season, the coastal areas and lowland valleys burst into bloom. Walking the Peabody Creek Trail, you’ll see pioneer Violet, trillium and twinflowers. Then, as the weather warms, the winter snow melts from the north-facing slopes of the mountains. Travels on Hurricane Ridge reveal mountain forest varieties of wildflowers, such as bunchberry, fairy slippers and ghostly Indian-pipes. Hike into the alpine zone on the Elk Mountain and Lillian Ridge trails for colorful images of phlox, anemone and woolly pussytoes. 4. 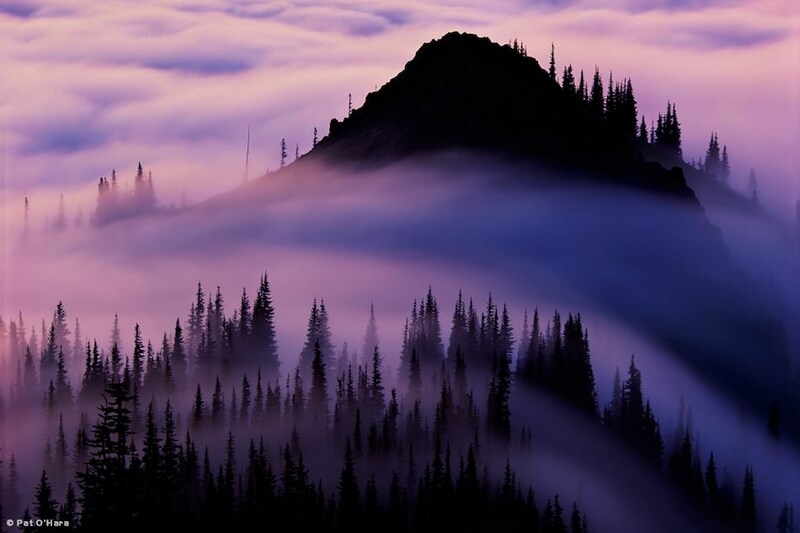 Hurricane Ridge, just south of Port Angeles on the north coast of the Peninsula, is also where you’ll find numerous advantageous shooting locations to capture majestic interior views of the Park’s tallest peaks, deep valleys and alpine meadows. 5. From Lake Crescent, climb even higher along the Pyramid Peak Trail to train your camera on the Strait of Juan de Fuca, which borders the Olympic Peninsula to the north. 6. At the eastern end of the Olympic National Forest, you can travel to the summit of Mt. Walker for equally amazing views of Puget Sound, Mt. Rainer and the other peaks of the Cascades. 7. Olympic National Park is also home to what the locals call Rain Forest Country. Hoh Valley, with its yearly average of 150 inches of rain, is the temperate equivalent of a jungle rain forest, but with the flora and fauna of the northern climes, such as five-hundred-year-old trees and wandering herds of elk. 8. Drive 50 miles west from Port Angeles to experience the totally different coastline environment of Clallam Bay and Sekiu. You’ll find many bird species, including puffins, migrating swans and others that nest and feed along this timeless stretch of the Pacific. Schedule time with your camera on Shi Shi Beach located in the National Marine Sanctuary, which Travel Channel rates as one of the best wilderness beaches in all of the U.S.
9. These are but a few of the visions and adventures on the Olympic Peninsula awaiting every serious photographer who wants to advance his or her skills. The experience will be even more rewarding if you join Visionary Wild’s Olympic Peninsula workshop, July 8–12, 2012. The five-day workshop is opened to just 12 photographers who want to focus intensely on advanced composition, pre-visualization, anticipation, planning for changing light and weather and shooting with post-processing tools in mind. Participants will have the opportunity to choose their own subject matter and photographic forms: landscape, macro, wildlife, abstraction, color, black and white, HDR, panoramas and multiple exposures. 10. Award-winning photographer Pat O’Hara will lead the Visionary Wild Olympic Peninsula Workshop, based on his many years traveling and photographing the area. Pat’s work has appeared in 17 books, including Washington Wilderness: The Unfinished Work and Washington's Wild Rivers. He has also been honored with the prestigious Lifetime Achievement Award from the North American Nature Photographers' Association. Justin Black, a protégé of the famed photographer Galen Rowell and co-founder of Visionary Wild, will serve as the trip leader and co-instructor. Justin is also a well-respected photographer, having been published in National Geographic Adventure, Sierra, American Photo, Outdoor Photographer and many other magazines. Visit the Visionary Wild Web Site at http://visionarywild.com/workshops/olympic/#more-670 for workshop details and the other workshops throughout the world scheduled during 2012.